MORE than 13 metres long and almost 4 metres high, with in excess of 380,000 parts, a life-sized replica of the BLOODHOUND Supersonic Car made entirely of K’NEX® toy construction pieces was revealed at the historic Brooklands Racing Circuit last week. The dimensions of the giant model, measured by the National Physical Laboratory, have been confirmed by Guinness World Records to break the record for the World’s Largest K’NEX Structure. Taking more than 1,287 hours to assemble, the giant model of the jet and rocket powered car was built in Aylesford, Kent by a team from Royal British Legion Industries (RBLI) which included both ex-Service personnel and disabled people. Dozens of BLOODHOUND fans also participated in the two month construction project. Former World Land Speed Record holder, BLOODHOUND Project Director Richard Noble, revealed the completed BLOODHOUND K’NEX model. He explained: “BLOODHOUND aims to inspire the next generation of scientists and engineers. 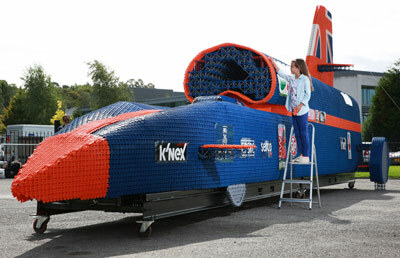 The giant build was commissioned by the BLOODHOUND 1K Club to promote The BLOODHOUND Project, which aims to inspire children about science and engineering by developing a 1,000mph land speed record car. The project is headed up by former and current land speed record holders Richard Noble and Andy Green, and is being used in more than 5,600 UK schools. With K’NEX construction pieces often playing a key role during schools’ activities, the project’s official supporters club was inspired to take things to another level. At 13.382m long, 2.44m wide and with a height of 3.874m, the impressive stats of the K’NEX model mirror those of the real supersonic vehicle and exceed those of the current record for the World’s Largest K’NEX Structure – a T-Rex, which is located in the U.S. Space & Rocket Centre in Huntsville, Alabama.